Maxwell, who demonstrated a prototype, said each exoskeleton was expected to cost in the tens of thousands of dollars. Drones, drones, drones. Our new overlords? NASA is pursuing a program that integrates unmanned aircraft systems (UAS) into the National Airspace System, or UAS-NAS. This involves identifying, developing, and testing the technologies and procedures that will make it possible for UAS to have routine access to airspace occupied by human-piloted aircraft. Four NASA centers support the UAS-NAS project: NASA’s Ames Research Center and Armstrong Flight Research Center in California, Langley Research Center in Virginia, and Glenn Research Center in Ohio. The UAS-NAS project is within the Integrated Aviation Systems Research Program, managed by NASA’s Aeronautics Research Mission Directorate at NASA Headquarters in Washington, D.C. The project uses modeling, simulations, and flight tests to develop and test technologies that provide safe, effective, secure capabilities including detect and avoid (DAA) and command and control (C2). ADELPHI, Md. – U.S. Army unmanned weapons experts are negotiating with Lockheed Martin Corp. to develop high-power microwave (HPM) weapons payloads to enable new generations of unmanned aerial vehicles (UAVs) to destroy or disable enemy drones. Officials of the Adelphi contracting division of the Army Contracting Command at Aberdeen Proving Ground, Md., announced plans Friday to negotiate sole-source with the Lockheed Martin Missiles and Fire Control division in Grand Prairie, Texas, on an HPM UAV weapons project. 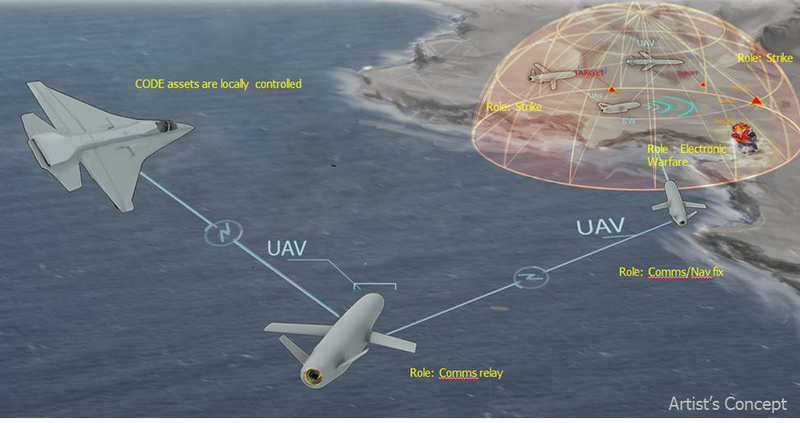 Lockheed Martin engineers will develop high-powered-microwave airborne counter unmanned aircraft systems (CUAS), including the necessary development, integration, and support necessary to field HPM weapons-equipped UAVs. Specifically, Army leaders want Lockheed Martin to develop HPM weapons and other kinds of UAV payloads able to disable or destroy adversary UAVs. Weapons payloads for UAVs that are under consideration include explosives, nets, entanglers, streamers, and high-powered-microwave systems. High-power microwaves represent a class of non-lethal weapons designed to destroy or disable enemy electronic systems with jolts of powerful electrical energy. It can fry electronics in much the same way as the electromagnetic pulse (EMP) from a nuclear detonation can disrupt electronics. 6 Aug. 2018 — The Air Force is rushing toward a mix of almost-ready and yet-to-be-developed technologies, including artificial intelligence (AI), cloud computing, hypersonics, drone swarms, and clouds of tiny cubesats capable of sucking up data and beaming it back down to operators the ground in real time. After running red team exercises looking at what some of the biggest future challenges might be for the Air Force, leaders concluded that the Predator and Global Hawk unmanned aerial vehicles (UAVs) of today are not far away from becoming mere museum pieces. The US Navy has revealed a video of the first commissioning tests of a railgun, a futuristic weapon that many people hope could shift the balance of power in naval warfare away from aircraft carriers and back to surface warships. The Navy has been pursuing the railgun for years, but the project has been hamstrung by the sheer amount of power required to make it work, measured in megajoules of electricity. UK-based BAE Systems appears to have made an operational railgun, however, and test fired it at the Naval Surface Warfare Center in Dahlgren, Virginia in November 2016. A short video of that test was made public by the Office of Naval Research on Tuesday. The railgun is designed around the principle of launching a metal projectile using a series of magnetic coils, rather than chemical propellant. Because of this, it is also known as the coilgun or Gauss rifle, after the German mathematician credited with discovering the concept in the 19th century. BAE Systems tested a 32-joule half-power prototype at Dahlgren in 2013. The full-power version was scheduled for testing in mid-2016 aboard the USNS Trenton, a Spearhead-class expeditionary transport, but the schedule was pushed back to mid-2017 without an explanation. Popular Mechanics has speculated that the railgun might end up being installed on board one of the three ships in the Zumwalt class, the experimental super-destroyer with a power plant strong enough to operate the weapon. The recently commissioned USS Zumwalt has been experiencing difficulties with its 155mm Advanced Gun Systems, designed around the projectiles that cost around $800,000 apiece. The threat of nuclear war, mostly background noise for the past 25 years, is alarming. But given the uniqueness of North Korea’s position in the world, it’s worth wondering how concerned we should actually be. To answer that question, we need to first identify the “we” we’re talking about. If that “we” includes South Koreans, the answer is: Quite a bit. The North Korean capital, Pyongyang, is about 120 miles from the South Korean capital, Seoul, home to 10 million people. That’s within easy striking range of North Korea’s existing arsenal of missiles, which is a key reason that the United States recently began deploying a Terminal High-Altitude Area Defense system, or THAAD, in South Korea, aimed at intercepting an incoming attack. Whether those missiles could carry an atomic or hydrogen bomb is another question, one we’ll get to in a moment. Of course, the proximity of North and South Korea means that there is a large risk from conventional weapons, as well. There are artillery already at the North Korean border that could strike Seoul, although it’s not clear how much damage would result. The threat of a missile hitting the U.S. If the “we” is the “we” most likely to read this article — residents of the United States — the calculus is a bit different. Excluding American forces in South Korea (about 25,000 of them), the greatest threat faced by the United States is of nuclear-tipped intercontinental ballistic missiles (ICBMs). Raising three questions: Does it have nuclear weapons? Are those weapons small enough to fit on a missile? And does North Korea have a missile that could reach the United States? The answer to the first question is yes, the North Koreans have repeatedly tested some form of nuclear device. In September, North Korea tested a bomb with an estimated yield of 10 to 20 kilotons — about the yield of the bomb that struck Hiroshima during World War II. That can do a lot of damage, but it pales in comparison with the sort of warhead currently in U.S. or Russian arsenals. At the time of that test, the North Koreans also claimed to have developed a weapon small enough to fit onto a missile, though this can be hard to verify. In February, the country released a photo showing a relatively small bomb that expert analysis figured might yield 20 kilotons and could be small enough to fit on a missile — if the photo actually depicted a working device. To strike the United States, though, the country would need a missile that could travel for thousands of miles, requiring a very specific type of missile. The Federation of American Scientists catalogues the missiles that North Korea has in its arsenal and those it hopes to add. To strike Alaska, it would need a long-range ICBM that could travel 7,000 kilometers, or about 4,300 miles. To hit the continental United States, it would need a full-range ICBM, which can range from 8,000 to 12,000 kilometers, or 5,000 to about 7,500 miles. The missiles that are under development in North Korea are of the Taepodong-2 variety. If launched from the Sohae launching station in the northwest corner of the country, nearly all of the United States would conceivably be within range, with the exception of southern Florida. On Saturday, North Korea announced that it had tested a rocket engine of “historic significance” — perhaps a liquid-fueled rocket that could serve as the second-stage of a full-range ICBM. But there’s no indication at this point that North Korea has such a device prepared — much less a missile that could reliably deliver a nuclear weapon at that distance with accuracy. While North Korean leader Kim Jong Un said last year that his regime had “entered the final stage of preparation for the test launch of an intercontinental ballistic missile,” there are a lot of parts that need to work together flawlessly to be effective: the stages of the missile, the bomb itself. That said, during World War II, the Japanese launched balloon-based bombs that they hoped would reach the U.S. mainland. Some did, killing six people in Oregon. Point being that even if there are low odds of a lot of things working perfectly, sometimes they can. In 2015, Adm. Bill Gortney told reporters that it was not likely that North Korea could strike the United States but that it was “prudent” to assume that it might be able to. Lasers have been a mainstay of sci-fi battles for decades. But making them practical for the battlefield has proven difficult. Now, private contractors and government agencies have developed weapons systems that are making science fiction a reality. This was made evident when Lockheed Martin and the US Army recently announced, a successful test of a 60-kilowatt (kW) laser. This one was twice as powerful as one they assessed in 2015. The weapon itself is a combined fiber laser, which means it doesn’t actually fire one but two lasers condensed into one beam, making it stronger. It uses fiber optics bundled together where each contributes energy to the beam, making the process scalable. The particular laser tested however was “diffraction-limited,” meaning it was close to the place where the beam could no longer be concentrated on a fixed point. Most military lasers today are too big and need too much power. New designs are blowing these models away. Getty Images. The system will soon be delivered to the Space and Missile Defense Command/Army Forces Strategic Command (USASMDC/ARSTRAT), in Huntsville, Alabama, where it will undergo further testing. Initially, the system reached 58 kW, a record. But Lockheed officials assured it will produce a 60 kW beam by the time it’s ready, sometime in the next few months. SMDC spokesman John Cummings said, “Our ultimate goal is to have a 100kW laser on a vehicle.” He added, “We have to take baby steps to get there.” Besides trucks, such lasers could be mounted on planes, helicopters, and ships. The US Air Force and DARPA are even working on laser shielding. That’s right. Force fields. Scientists from Scotland and the Czech Republic have created a real-life “tractor” beam, as featured in the Star Trek movies that, for the first time, allows a beam of light to attract objects. Although light manipulation techniques have existed since the 1970s, this is the first time a light beam has been used to draw objects towards the light source, albeit at a microscopic level. Researchers from the Univ. of St Andrews and the Institute of Scientific Instruments (ISI) in the Czech Republic have found a way to generate a special optical field that efficiently reverses radiation pressure of light. The new technique could lead to more efficient medical testing, such as in the examination of blood samples. In the U.S. science fiction show, a tractor beam was a method of using a beam of light which could pull space-ships and other large objects towards the source of the light. The team, led by Tomas Cizmar, Research Fellow in the School of Medicine at the Univ. of St Andrews, with Oto Brzobohaty and Prof. Pavel Zemanek, both of ISI, discovered a technique which will allow them to provide “negative” force acting upon minuscule particles. Normally when matter and light interact the solid object is pushed by the light and carried away in the stream of photons. Such radiation force was first identified by Johanes Kepler when observing that tails of comets point away from the sun. Over recent years researchers have realized that while this is the case for most of the optical fields, there is a space of parameters when this force reverses. The scientists at St Andrews and ISI have now demonstrated the first experimental realization of this concept together with a number of exciting applications for bio-medical photonics and other disciplines. The exciting aspect is that the occurrence of negative force is very specific to the properties of the object, such as size and composition. This in turn allows optical sorting of micro-objects in a simple and inexpensive device. Over the last decade optical fractionation has been identified as one of the most promising bio-medical applications of optical manipulation allowing, for example, sorting of macromolecules, organelles or cells. Interestingly, the scientists identified certain conditions, in which objects held by the “tractor” beam force-field, re-arranged themselves to form a structure which made the beam even stronger. via Scientists Create Star Trek’s Tractor Beam. LONG BEACH, California — Eighteen-year-old Taylor Wilson has designed a compact nuclear reactor that could one day burn waste from old atomic weapons to power anything from homes and factories to space colonies. The American teen, who gained fame four years ago after designing a fusion reactor he planned to build in the garage of his family’s home, shared his latest endeavor at a TED Conference in southern California on Thursday. “You can plop them down anywhere in the world and they work, buried under the ground for security reasons,” he said, while detailing his design at TED. His reactors are designed to spin turbines using gas instead of steam, meaning they operate at temperatures lower than those of typical nuclear reactors and don’t spew anything if there is a breach. The fuel is in the form of molten salt, and the reactors don’t need to be pressurized, according to the teenager. “In the event of an accident, you can just drain the core into a tank under the reactor with neutron absorbers and the reaction stops,” Wilson said. “Not only does it combat climate change, it can bring power to the developing world,” Wilson said with teenage optimism. via AFP: US teen designs compact nuclear reactor. The Pentagon is turning to the private sector, universities and even computer-game companies as part of an ambitious effort to develop technologies to improve its cyberwarfare capabilities, launch effective attacks and withstand the likely retaliation. The previously unreported effort, which its authors have dubbed Plan X, marks a new phase in the nation’s fledgling military operations in cyberspace, which have focused more on protecting the Defense Department’s computer systems than on disrupting or destroying those of enemies. Plan X is a project of the Defense Advanced Research Projects Agency, a Pentagon division that focuses on experimental efforts and has a key role in harnessing computing power to help the military wage war more effectively. Cyberwarfare conjures images of smoking servers, downed electrical systems and exploding industrial plants, but military officials say cyberweapons are unlikely to be used on their own. Instead, they would support conventional attacks, by blinding an enemy to an impending airstrike, for example, or disabling a foe’s communications system during battle. The five-year, $110 million research program will begin seeking proposals this summer. Among the goals will be the creation of an advanced map that details the entirety of cyberspace — a global domain that includestens of billions of computers and other devices — and updates itself continuously. Such a map would help commanders identify targets and disable them using computer code delivered through the Internet or other means. Another goal is the creation of a robust operating system capable of launching attacks and surviving counterattacks. Officials say this would be the cyberspace equivalent of an armored tank; they compare existing computer operating systems to sport-utility vehicles — well suited to peaceful highways but too vulnerable to work on battlefields. The architects of Plan X also hope to develop systems that could give commanders the ability to carry out speed-of-light attacks and counterattacks using preplanned scenarios that do not involve human operators manually typing in code — a process considered much too slow. via With Plan X, Pentagon seeks to spread U.S. military might to cyberspace – The Washington Post. Media reports say the shooting exercise, using live ammunition, took place at the SA Army’s Combat Training Centre, at Lohatlha, in the Northern Cape, as part of an annual force preparation endeavour. Electronics engineer and defence company CEO Richard Young says he can’t believe the incident was purely a mechanical fault. He says his company, C2I2, in the mid 1990s, was involved in two air defence artillery upgrade programmes, dubbed Projects Catchy and Dart. But the brave, as yet unnamed officer was unable to stop the wildly swinging computerised Swiss/German Oerlikon 35mm MK5 anti-aircraft twin-barrelled gun. It sprayed hundreds of high-explosive 0,5kg 35mm cannon shells around the five-gun firing position. By the time the gun had emptied its twin 50-round auto-loader magazines, nine soldiers were dead and 11 injured. Using the hard-learned lessons of his Project Grizzly experience — a 20-year odyssey that included a National Film Board documentary, an appearance on CNN and personal bankruptcy — he’s ready to start selling his newest idea. Already, he says, the suit has stood up to bullets from high-powered weapons, including an elephant gun. The suit was empty during the ballistics tests, but he’s more than ready to put it on and face live fire. Google TechTalk (video) – Should Google go Nuclear? The day when you can buy your own robot exoskeleton (for whatever devious use you have in mind) is getting closer. Tsukuba University engineering professor Yoshiyuki Sankai’s HAL robot suit is pretty close to production — up to 20 of the suits should ship next year, and 400 to 500 in 2008.